The near-instant gratification of crocheting a hat makes it an ideal first project for beginners. A hat can be worked flat and doesn't take nearly as much yarn or as much time to complete as a scarf. By learning just a few basic stitches, you can create a beautiful hat that'll keep your head warm and cozy. The yarn should have a recommended hook size and a sample gauge, or tension, listed on the label --this tells you how many stitches to expect per inch with the stated hook size. If you choose a yarn weight other than worsted, check the label and create a swatch with the suggested hook to see how it works up. Hold your hook in one hand and create a slip knot to secure the yarn on your hook. Use your hook to create 56 chain stitches. The foundation chain in this pattern determines the height of your hat. 56 chain stitches will accommodate most teenage and adult heads measuring 7.5 to 8 inches high. For a larger or smaller hat, simply add or subtract three chain stitches per inch of height from the crown of the head to just below the ears. Count three chain stitches from the hook, not counting the loop on your hook as a stitch. Loop the yarn over the hook once and insert it into the third stitch from the hook, creating the foundation for a double crochet stitch. Wrap the yarn over the hook and pull it through the first loop on your hook -- the third chain stitch that you picked up. Wrap the yarn over the hook again and pull it through the first two loops on the hook. 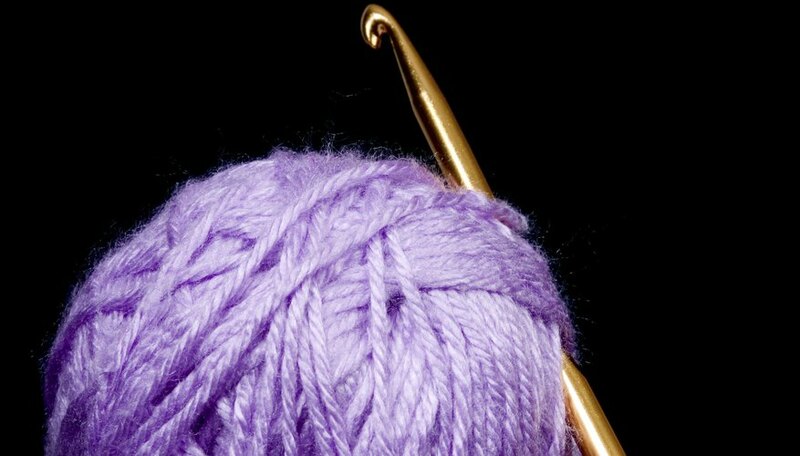 Wrap the yarn over the hook for a third time, and pull it through the remaining two stitches on the hook. You have completed one double crochet stitch. Create one double crochet in each chain stitch across the row for a total of 54 stitches. Chain three stitches and turn your work. Turning your work is exactly what it sounds like -- simply flip it over and start working in the opposite direction from the last row. Insert your hook through the back loop only of the second stitch from the hook. Create a double crochet stitch in each stitch across the row, again inserting your hook in the back loop of each stitch. This creates a ridge or rib, which will make the hat stretchy enough to accommodate a variety of head types and sizes. After each row, chain three stitches and turn your work. Called the turning chain, this will keep your stitch count consistent and give you a nice, firm edge. Work each subsequent row as you did the second row, working strictly through the back loops only for the remainder of the hat. Create rows until the length of your work is equal to the circumference of your head. Don't crochet a turning chain at the end of your final row. Cut your yarn, leaving an 18-inch-long tail. Remove the hook from the last stitch and draw the yarn tail through the loop, pulling tightly to secure and finish off the project. Place the sides of the hat together and sew together. Run a line of stitches through the top of the hat and gather tightly to close. Turn the hat inside-out to hide the seams. Wash and dry according to the yarn manufacturer's instructions to even out the stitches and make the finished hat look neater. If you don't want anyone to see the top gathers of the hat, consider adding a pompom or other decorative element to the top of the hat to hide the seam.